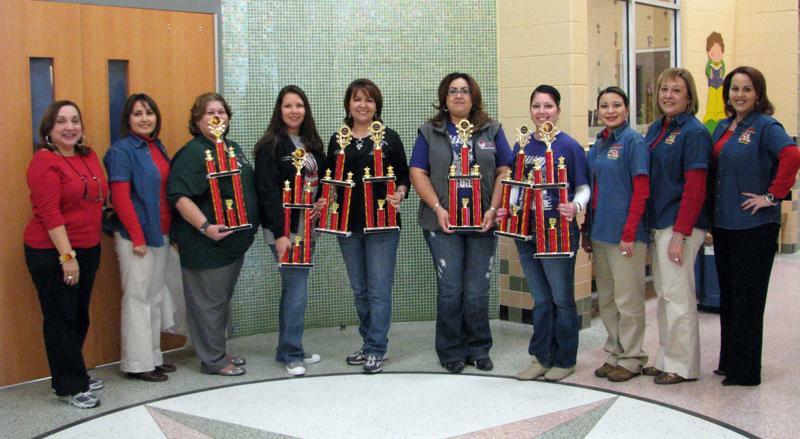 Ringgold Elementary hosted its 5th UIL Invitational Meet. We would like to thank and congratulate all coaches and students from the different elementary schools who participated in this exciting event. Congratulations to Dr. Mario Ramirez Elementary-1st place, J & O Hinojosa Elementary-2nd place and North Grammar Elementary-3rd place. Pictured are Edna Gonzalez-Rio Grande City CISD UIL Coordinator, Nydia Benitez-Ringgold Elementary Coordinator, Gloria Alvarez-North Grammar Elementary Assistant Principal, Marissa Aguilar-J & O Hinojosa Elementary Assistant Principal, Maricela Garcia-J & O Hinojosa Principal, Laura Ramirez-Dr. Mario E. Ramirez Elementary Assistant Principal, Adela Trijo- Dr. Mario E. Ramirez Elementary Principal, Mrs. Erica Canales, Ringgold Elementary Assistant Principal, Maria Elena Olivarez, Ringgold Elementary Principal and Jessica T. Saenz-Ringgold Elementary Counselor. RGCCISD photo.